Charlie was born in the High Arctic, a world of snow, ice and polar bears. Owned by an Inuit polar bear hunter, he had no name, was fed only frozen seal meat twice a week and chewed ice for water. His year-round home was the barren sea ice. 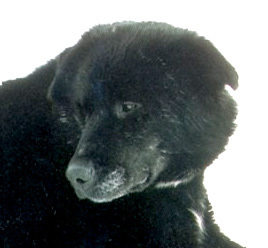 He was a large, black, part-wolf, Canadian Inuit Husky. Although he existed in a tough and primitive environment, he was a lovable, gentle dog. Trained to keep polar bears out of his village, he would if necessary, defend humans against ferocious polar bear attacks. Well known for his courage, he had demonstrated his bravery on more than one occasion. When Helen Thayer decided to walk alone to the Magnetic North Pole, she knew it was very probable that she would encounter polar bears. Helen bought the dog from the Inuit hunter to warn and protect her throughout her journey. She promptly named him Charlie. Charlie quickly learned to love the first human to call him by name and to invite him into a warm tent to sleep. Many times he sensed and made Helen aware of approaching polar bears long before she was aware of them, and he saved her life from one that did attack. Charlie traveled at Helen's side for 364 miles -- all the way to the Pole. Helen recounts the many harrowing experiences and moments of triumph that she and Charlie shared in her book, Polar Dream. At the journey's successful end, Charlie returned with Helen to the home she shared with her husband Bill, in Snohomish, Washington. Helen helped Charlie adapt to a wonderful new world of grass, trees, flowers and rain. He was introduced to and made friends with the other three family dogs, the cat and five goats. 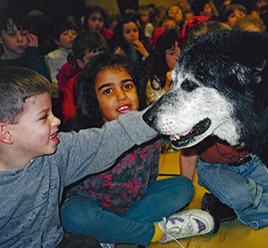 Charlie was also an integral member of a 1994 wolf study. Charlie, Helen and Bill walked 600 miles above the Arctic Circle, across the Canadian Arctic, to live for months beside a den of wolves -- to observe and document the life of a wolf family in the true wild. Helen writes of their adventures in the book, Three Among the Wolves. Charlie enjoyed a casual life of retirement after all of his trials, earned by the contribution he had made to Helen's success. He romped on 12 acres overlooking the snowy Cascade Mountains, ran 6 to 10 miles each morning with Helen and Bill and accompanied them on mountain climbs, hikes and ski trips. Charlie would steal the show when Helen took him along to school assembly presentations. Children instantly fell in love with him. He would circulate throughout the classrooms, tail wagging, looking for pats and attention. He charmed everyone who met him and added a lot of joy to the human world. Following his early adventures and later years of retirement and good health, Charlie passed away in 2007, at the unusually old age of 23. Helen is currently completing Charlie's biography, Charlie -- A Hero At My Side. It is a book that is eagerly awaited by all that have come to know, admire and love Charlie through Helen's books. Charlie was indeed a very special dog.